Retailers can learn from the Circular Economy by becoming communities and not just sequences of job functionality. Positive actions & interactions stimulate others. Waste is minimised. Waste of resources, products and of time. And the waste of people – their energy, goodwill, knowledge, ideas and enthusiasm. I have to say that the concept of the “Circular Economy” is a rather recent discovery to me. Perhaps not the philosophy and the processes but the words themselves neatly summing up the principle of minimising wastage and maximising resources. It is of course highly relevant to retail and its traditionally linear processes and supply chains. However, beyond the realms of physical product, the idea of maximising resources and reducing waste applies to many spheres of retail. From maximising personnel skills and enthusiasm, to creating 2-way conversations and cyclical relationships with suppliers and customers the world of opportunities is certainly not flat. 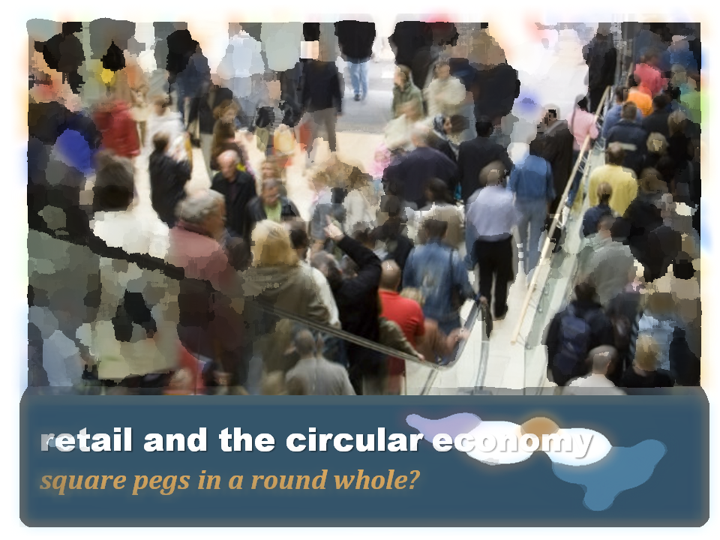 The circular economy for retailers is not just about recycling and saving the planet. It’s about business efficiency and commerciality and saving yourselves. Its worth taking a lightening tour through some of the opportunities. The supply chain is the obvious place to start. Manufacturers and retailers are becoming accustomed to building sustainability into processes, material re-use and re-cycling. They are also discovering that commercial profit comes from substituting services for commodity, not only adding value, delivering margin & sell-through but also through acquiring customer admiration and loyalty. Take the example of Burberry working alongside Elvis & Kresse to convert mountains of wasted leather cut-offs into new luxury accessories. In deed Elvis & Kresse are the masters at cyclical retail, piggy-backing the supply chains of other brands to create their distinct business model. The recycling of London Fire Brigade hose pipes into fashion accessories and then the donation of 50% of profits back into the service is a stroke of commercial and PR genius. It is also a shining example of the genuine philanthropy at the heart of new business. Bringing the customer into the retail circle. Made.com is a serious disruptor in the furniture market. Not least with its “Talent Lab” initiative. Here we see individual designers submitting their furniture prototypes into a public auction where a world of potential customers vote with their sales commitment on whether they like a product or not. The most popular, and directly the most commercially viable, are then put into production. Only pre-bought product is produced, waste is eliminated, the designer and customer feel empowered and the supply chain delivers at an acceptable rate for a patient customer awaiting a product in which they have a personal investment. No less cyclical, and equally disruptive in its time, is the fast-fashion principles of Inditex. Whilst Zara probably is not held up as saviours of the planet, the focus on fast learning and production of what will sell, reduces overstock, wasteful investment. Its commercial success is a testament to its completely cyclical processes. No coincidence that Inditex was formed by a shirt maker with first-hand knowledge of the benefits of listening to his customers. Made.com doesn’t finish its disruption of customer engagement with “Talent Lab”. As with other retailers, such as The White Company and Floral Street, it creates a platform for its customers to show off their purchases in the situ of their own homes, Made Unboxed. Happy customers just seem to love showing off not only their purchases, but their wider home décor achievements and very happy to promote the products and the retail businesses that have made them happy. Probably the best example of this perfect virtuous circle of admiration is Primark. Smart enough and brave enough to turn its back on e-commerce as a commercial dead-end its website is dedicated to Primania. Millions of Primark customers turn themselves into fashion models posting photos of themselves in their latest Primark purchases, projecting themselves as fashionistas. A voracious audience perpetually chooses their favourite outfits, recommends garments and propels the people behind the best looks and most popular posts to the realms of Primark deities. The customer gains fame and notoriety, whilst Primark generates free and authentic marketing in a cycle of mutual benefit. Ever-increasing circles of new retail. Going back to Floral Street. Literally a beautiful little business creating and selling floral based perfumes. Visit the store in Covent Garden. The select perfumes are housed in 100% sustainable packages. Read about the evolution of the material and construction process on their website. In addition to being sustainable packaging the boxes also form the creative element in the walls of the new store design. However, the story doesn’t end there. Customers are asked to send pictures of how they re-use their recyclable packages at home, showing off their creativity & commitment from jewellery boxes to flower pots. Sustainable products providing sustainable stories. Remaining in the beauty sector, the familiar Lush illustrates how engaging its store personnel, by embracing them into circular processes, has re-energised its stores and its processes. Rotating staff throughout the day keeps then active and engaged, continuous 2-way product communication ensures their interest and passion, whilst store personnel sessions create an ongoing culture of optimism and improvement. A prime example of this cyclical engagement is that staff loyalty, more than a year’s employment, is rewarded with their ideas for new products being considered for production, with consultation and factory visits. Lush listens to its staff and the staff listen to Lush. What’s refreshing about new business models, in both established and new retailers, is the cyclical nature of the interactions. Every positive action stimulates another and so on. Waste is minimised. Waste of resources, waste of products, waste of time. And the waste of people – their energy, goodwill, knowledge, ideas and enthusiasm. It’s surely worth building into every retail process and operation the principles of cyclical interactions. Retailers need to become communities and not just sequences of job functionality. How can you maximise the input of your staff and your customers? Do you have too many dead-ends for improvement opportunities?